Landscape plants perform best in soils that contain pore spaces that allow water, air and roots to move freely deep into the soil. 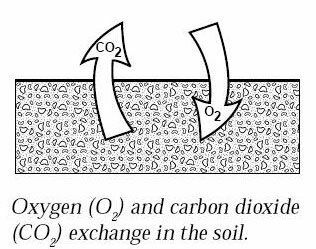 Ideal soil structure consists of 50% particulate matter, 25% available pore space for water, and 25% available pore space for air. The size and arrangement of various soil particles as well as the presence of organic matter and microorganisms are key factors in balanced soils and healthy roots. In many regions, soil types have been disturbed and compacted so that air and water movement is greatly reduced if not diminished. Use a spading fork to loosen the soil around the drip zone of plants to desired depth for root growth. Fill the cracks to the surface with PermaTill. Top-dress with compost if needed. Tamp and water thoroughly. For large trees and shrubs professionals recommend vertical mulching and radial trenching out from the drip zone. Fill trenches and auger holes with PermaTill for long term aeration. Professional arboricultural specifications are available for these methods at our specification library. Stalite PermaTill is an excellent soil cover mulch. It does not deteriorate or compact the soil surface. It reduces stem rot and soil borne diseases on the foliage of susceptible plants. Weed seeds do not germinate in PermaTill, and PermaTill deters slugs. PermaTill restores healthy soil structure but does not replace the needs for organics. If your soil is low in organic content add 10-15% good compost along with the PermaTill. Compost adds beneficial microbial activity to the soil and needs to be replaced from time to time. PermaTill is a permanent structural component that only needs to be installed once. Plants with Deep Roots are more Resistant to Drought! High water release curve allows for root uptake and movement through the soil. Remove unwanted vegetation and debris. Spread the layer of PermaTill over the entire area to be amended. If organic matter is required, add ½" layer of approved compost in addition to the PermaTill. How much PermaTill depends on the desired root depth and the existing soil. Rule of thumb: The more compacted the soil is, the higher the rate of PermaTill will be. You only have to add it once. So do it right.